Terms Specific to Market Data provided by the CBOE Futures Exchange (CFE). Customer’s use of CFE Market Data shall comply with such policies with respect to the CFE Market Data (“Market Data Policies”) as CFE may adopt and make publicly available from time to time. CFE shall not implement an amendment in its Market Data Policies until at least 90 days after CFE has made the amended Market Data Policy publicly available and has notified Vela of the change. Customer shall receive CFE Market Data solely for use by Customer and/or its majority-owned subsidiaries (including, without limitation, the use by their respective employees on behalf of such Customer and/or its majority-owned subsidiaries). Customer shall not retransmit or otherwise furnish CFE Market Data to any person other than Customer’s employees (and Customer acknowledges and agrees that this requirement does not prohibit the furnishing of specific items of CFE Market Data directly relating to particular transactions or situations occurring in the normal conduct of Customer’s business to persons other than Customer’s employees). Customer acknowledges that the CFE Market Data is and shall remain the property of CFE. Customer acknowledges the absence of any guarantee and the disclaimer of liability on the part of CFE as stated in this section of the relevant Purchase Order. Customer shall indemnify CFE in terms substantially equivalent to those of Section 11 of the Uniform Subscriber Addendum (“USA”) as it may exist from time to time. Customer shall provide the right to inspect Customer’s offices or locations and the right to audit the Customer’s books and records relating to its use of CFE Market Data on terms substantially equivalent to those of Section 5 of the USA. Customer acknowledges that its right to receive CFE Market Data may be terminated by Vela upon 30 days’ notice, that Customer may terminate its obligation to purchase CFE Market Data upon 30 days’ notice, and that Customer’s access to CFE Market Data may be terminated by Vela upon a determination by Vela or CFE that Customer is not providing accurate reports with respect to its use of CFE Market Data or is otherwise not in compliance with this agreement. Customer may be required to provide “Datafeed Access Declarations” or similar statements relating to Customer’s access to CFE Market Data upon request. 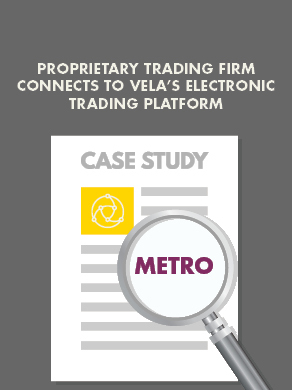 discontinue circuits carrying CFE Market Data; provided, however, that CFE agrees to give Vela at least 90 days notice of any such action, and Vela shall give prompt notice to Customer. If Customer does not accept any such change, Customer may (without limiting Customer’s other rights to terminate this Agreement) terminate this Agreement effective as of the close of business on the day before the change is to become effective by giving Vela at least 30 days’ notice of its decision to do so.